You stamp smarter than the rest of us for these challenges!! I made cards for each challenge while you combined to make one! Great idea - really cute and creative card! Hi Seongsook, each card that is posted reminds me why I love paper piecing and yours is no exception! 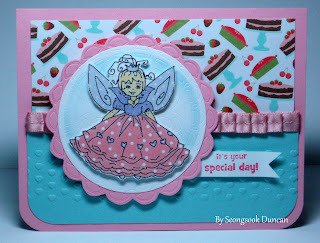 Love your polka dot fairy, scalloped circle, and background DP. A little girl will just adore it! I love how you've combined challenges into your one card. Your card is very fun! Thanks for joining us in the Be A Rebel VCMP! This will be a perfect card for a little girl! Your fairy is cute. Very pretty card. Seongsook, you are brilliant to make one card to fit so many challenges! I've been making one for each and I can't keep up either! I love your card with the little fairy and that cute cake background paper.